Those of a certain persuasion will have had to tear themselves away from their copies of Grand Theft Auto V to get to Vicarage Road on Tuesday. Scourge of middle-class adults, an emblem of the degradation of society and a terrible role model for kids; yes, the underperformance of Watford’s foreign legion on Saturday meant we were in need of a convincing performance, or at the very least a win, to show that we still mean business. The first half didn’t really provide it. There were odd glimpses of promise but on the whole it felt very disjointed. The three defenders were solid individually, especially Gabriele Angella who shone once again, but didn’t function especially tidily as a unit. Doncaster were extremely lax with their finishing and with a bit more composure could have made the most of several free headers in the box – something that is becoming a worryingly regular occurrence from set pieces. Doyen of web-based Watford literature Matt Rowson mused on the lack of sharpness in our attack on Saturday, saying that the combination of Forestieri and Fabbrini led to a surplus of fancy and aimless maze-ups and not enough attempts to break with pace. Both were consigned to the bench for this match, and the tempo went from one extreme to the other. 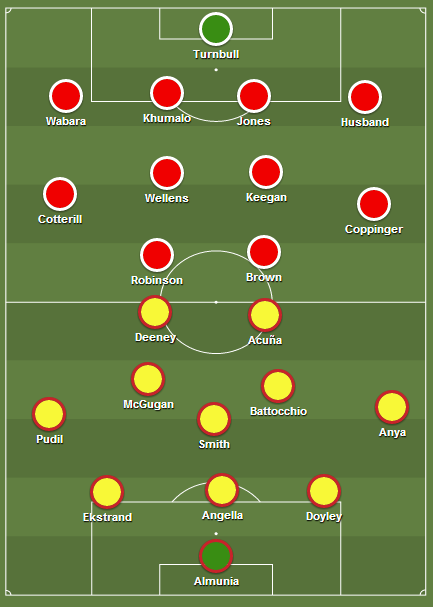 The onus was clearly on the defenders to get the ball forward quickly, leaving Deeney and Acuña to scrap for aerial balls against the monolithic Rob Jones or Anya and Pudil to chase over-hit passes into the channels. When possession was retained into the final third, it was too hurriedly relinquished. One-touch passes caught the strikers on their heels and didn’t provide the three-man midfield with enough time to catch up with the attacks. It was by no means bad, and a marked improvement on Saturday, but still wasn’t up to much. Scoring goals was always going to be hard, of course, given the calibre of the goalkeepers on the pitch. Manuel Almunia’s 70 minutes in the 2006 Champions League final perhaps gave him the edge over Ross Turnbull who, some would say, was unfairly limited to the bench for Chelsea’s 2012 victory in the same competition. Nevertheless, clearly we were witnessing two goalkeepers operating at the very top of their trade. Something of a shock, then, that a three minute period saw both make rickets that one would expect of a mere mortal. First, as the fog descended upon Vicarage Road, Lewis McGugan shifted his way through a couple of challenges into space created by Acuña’s clever movement before shaping to lob Turnbull from the edge of the area. He didn’t get enough on it, and floated the ball just over head height at the keeper, who – is it mean to say ‘Bonhamed’ it? – into his own net. Barely had the Watford fans finished sending their celebratory texts to absent loved ones when Theo Robinson, the speedy ex-Academy graduate, rifled in a shot from distance which Almunia could only parry and then watch as Chris Brown punched in the rebound. The second half brought improvement, particularly after Forestieri took the place of Acuña. Possession hereafter was dominated, though chances were still scarce. The midfield, who – save for McGugan – struggled in the first half, seemed more comfortable. Connor Smith had been brought in for the knocked-up Iriney and appeared overly-keen to impress. A few phenomenal passes interrupted a performance that, while not bad per se, was full of sloppy mistakes. Cristian Battocchio beside him was finally included after a lengthy period of pleading from fans and responded with an anonymous first half that didn’t show any of the skills we felt had been missing from the last few Watford performances. The second half saw them both come into the game more, and the pace slow down. The wing-backs were getting forward, and we were trying to carve out chances instead of force them. Forestieri’s impact as a substitute is an odd one. It’s not that he comes on and take the game by the scruff of its neck, but he changes the tone completely. Even when he’s standing stationary on the ball there’s a bounce in his knees – a fire in his eyes – that gives everyone a lift. Like how a tired household, long bereft of its youthful joie de vivre can be reinvigorated by a trusty but slightly dim canine companion. On top of that, his movement on the ball provided space elsewhere, and he was able to work himself into several shooting opportunities that he wasted. But chances are chances. It looked like the improvement was all going to be in vain. Sean Murray had come on and added to Forestieri’s good work, and Fabbrini was being readied for one last assault (though his siege tactics are presumably more trumpets at the gates than battering rams and ballistae), when Murray rode a challenge and made to move into the box before being felled by James Husband. My initial thought was that it was outside the area, and the brief action shown on Sky Sports News suggests it was, but it was given, just as the blatant Charlton handball on Saturday wasn’t, and McGugan dispatched it. Wonderful. It was an important three points. Not because automatic promotion was slipping from our grasp or similar sensationalist conclusions that people seem desperate to make, but because it adds to the togetherness of the group and adds to their experience. We’re not in as odd a place as were this time last year, but there’s still a lot of new faces and we need to learn how to win with this group of players. At this stage of the season every game exists in singularity. The first few months are about getting as many points as you can before storylines and run-in implications are deciphered. After Christmas, every loss is lamented – ‘oh no, we’ve lost three points on QPR’ – but now we can move on from disappointing results, consign them to the pages of Rothmans, and focus on positives. So let’s do that. Back to winning ways, and we’re still not playing to the best of this squad’s ability. P.S Do you think when Kiko Macheda left Lazio training for the last time in 2008, destined for Manchester United, he grasped the arm of a weeping Davide Faraoni, looked him in the eyes and whispered, ‘it’s ok, we shall meet again at Vicarage Road when the mighty Doncaster Rovers come to town’? Me neither.